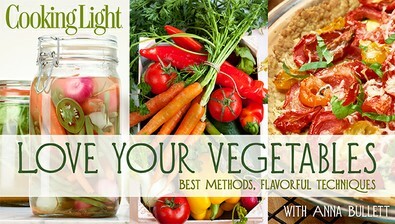 Transform nutritious vegetables into crave-worthy meals your family will love with essential techniques for cooking seasonal vegetables year-round. _Cooking Light_ executive chef Anna Bullett will share her expert tips for cutting and roasting winter squash with ease, incorporating hearty greens such as kale into mouthwatering pastas and even caramelizing Brussels sprouts and pairing them with crispy pancetta for a dish that will please your pickiest eater. Enjoy more than 20 recipes included with this class, from a tomato ricotta tart to grilled eggplant sandwiches with creamy aioli. Plus, get a bonus lesson on refrigerator pickling and preserve your favorite vegetables at the peak of their season.